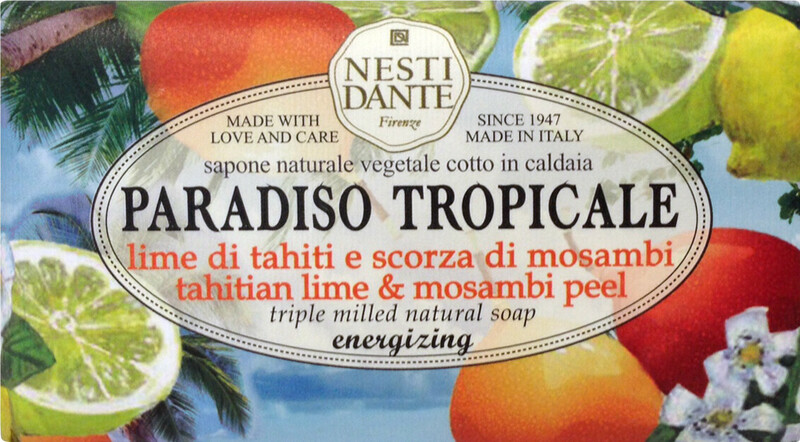 Experience the magic of a tropical island with the Nesti Dante Paradiso Tropicale Tahitian Lime and Mosambi Peel Soap Bar. Evoking the endless beaches and exotic aromas of a beautiful island, the Paradiso Tropicale Tahitian Lime and Mosambi Peel Soap will whisk your mind away to a warmer climate. Enriched with an energizing blend of citrus aurantifolia, the triple milled natural soap will lift your mood with its delicious composition. Beautifully handcrafted using the traditional cauldron method, the indulgent soap will leave your skin feeling cleansed, refreshed and subtly scented with a thoroughly uplifting aroma. Work into a lather on damp skin and rinse thoroughly.